Subdued, but elegant, our French Lace table cards bode well for most any wedding theme, from country chic to French glamour. The lace detailing has a white shade that subtly offsets a pastel peach finish. Dark lettering creates a bold contrast, putting your guest name in the forefront. 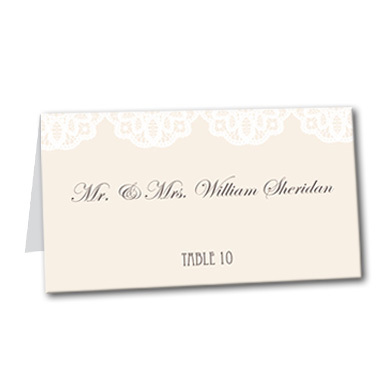 French Lace Table Card For the best experience, we recommend personalizing your stationery on a desktop computer.